Note: The difference between the PS406 and the PS406U is that the PS406U comes with ultrasonic double-feed detection. The Plustek SmartOffice PS 406 is a 40 page per minute, duplex color document scanner that is not only fast, it's reliable and cost effective. Robust paper handling, advanced image processing and a high daily duty cycle all add up to the perfect departmental scanning solution for document management, content management and forms processing applications. The SmartOffice PS406 features one of the most advanced document feeding and separation system in the industry. This system allows the SmartOffice PS406 to scan mixed batches of varying paper sizes and weights. No more wasted time sorting documents based on their size or thickness. Plastic and rigid cards such as ID cards, Drivers Licenses, Membership Cards, and Insurance Cards are scanned without additional adjustments or additional set up. The SmartOffice PS406 scans in color, grayscale or black and white at up to 600dpi. Advanced Image Processing automatically adjusts, straightens and crops documents with no operator intervention. The result? Higher OCR accuracy and fewer rescans. 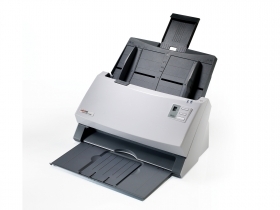 The 100 sheet feed tray along with a daily duty cycle of 5000 pages mean that the SmartOffice PS406 is a scanner that is designed to scan documents every day, all day long. Create searchable PDFs at the touch of a button. Single Touch scanning allows you to define 9 different scanning functions that can all be accessed by simply pressing a button. In addition to searchable PDF, you can transform your paper documents into editable Microsoft Office document formats or common image formats such as JPG and TIF. The SmartOffice PS406 is bundled with business card reading software and a suite of document management and scanning applications to allow you to be productive right out of the box. Industry standard TWAIN and WIA drivers ensure compatibility with thousands of image enabled applications. The SmartOffice PS406 is eco-friendly. In standby mode, power consumption is less than 0.5 watts. In operation, power consumption is less than 24 watts. In addition it meets the ErP and Energy Star standard certification, WHEE and RoHS standards.